Condolence references can be once in while periodically say once in two/three months and not frequently,suggested the Bench. The Supreme Court has held that suspension of court work or strikes are clearly illegal and it is high time that the legal fraternity realises its duty to the society which is the foremost. A bench comprising Justice AK Goel and Justice UU Lalit observed this while issuing guidelines to tackle pendency of cases. It was pointed out by the bar that obstruction of court proceedings by uncalled for strikes/abstaining of work by lawyers or frequent suspension of court work after condolence references were matters of great concern. The bench observed that hardship faced by witnesses if their evidence is not recorded on the day they are summoned or impact of delay on undertrials in custody on account of such avoidable interruptions of court proceedings was a matter of concern for any responsible body of professionals and they must take appropriate steps. “In any case, this needs attention of all concerned authorities – the Central Government/State Governments/Bar Councils/Bar Associations as well as the High Courts and ways and means ought to be found out to tackle this menace,” the court said. The bench also directed that the high courts may take such stringent measures as may be found necessary in the light of judgment of Ex. Captain Harish Uppal Vs Union Of India. 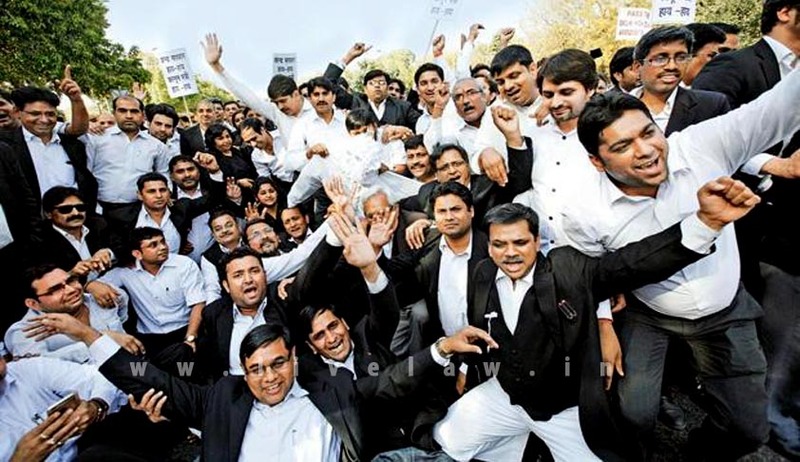 In Harish Uppal case in 2002, a three-judge of the Supreme Court held that lawyers have no right to go on strike or give a call for boycott, not even on a token strike. It further held: “The protest, if any is required, can only be by giving press statements, TV interviews, carrying out of Court premises banners and/or placards, wearing black or white or any colour arm bands, peaceful protest marches outside and away from Court premises, going on dharnas or relay fasts etc. It is held that lawyers holding Vakalats on behalf of their clients cannot attend Courts in pursuance to a call for strike or boycott. All lawyers must boldly refuse to abide by any call for strike or boycott. No lawyer can be visited with any adverse consequences by the Association or the Council and no threat or coercion of any nature including that of expulsion can be held out. It is held that no Bar Council or Bar Association can permit calling of a meeting for purposes of considering a call for strike or boycott and requisition, if any, for such meeting must be ignored. It is held that only in the rarest of rare cases where the dignity, integrity and independence of the Bar and/or the Bench are at stake, Courts may ignore (turn a blind eye) to a protest abstention from work for not more than one day”.